To celebrate the beginning of the works for Tate Modern’s new building, Swedish artist Martin Karlsson has created a project on the 100-metre hoarding that encloses the works. 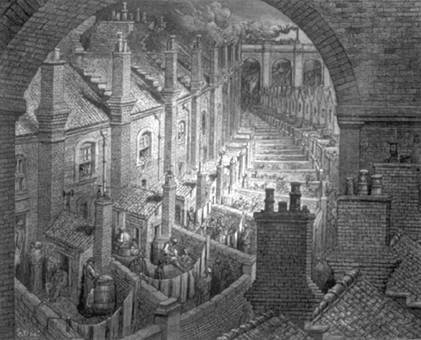 London – An Imagery 2008–9 takes as its starting point Gustave Doré’s gothic etchings published in 1872. 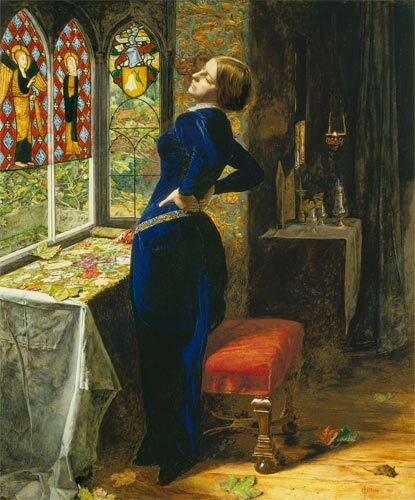 For this Thursday’s core-course class (the last of this term) we will be discussing Millais’ lovely painting ‘Mariana’ (1851). By way of preparation it would make sense to (a) have a look at the picture, there; and (b) read the Tennyson poem, ‘Mariana’, upon which it is based. If you’re feeling keen, have a look at Shakespeare’s Measure for Measure, from which play Tennyson took the character of Mariana. Also useful is this (not very long) introductory piece by Andrew Leng about Millais’ picture: check that out too. But mostly, look carefully at the painting. [Note: Leng mentions Ruskin’s 1878 essay ‘Three Colours of Pre-Raphaelitism’; you can find this online in several places, if you’re interested. Google books have it here (the Millais stuff starts on p.334 right at the bottom: Ruskin’s section 244). This coming Thursday we all step inside the Bleak House. Hopefully you’ve all read the novel, but for the purposes of seminar discussion I’d like to start out by concentrating on just the first chapter, and in particular on Dickens’s famous descriptions of London mud and London fog. Metaphor and metonomy are both modes of saying something by saying something else; but metaphor is a mode of displacement (‘Achilles is a lion’), where a point of similarity (they’re both really brave and fierce) links what are otherwise quite different terms; and metonymy is a mode of association, or contiguity (‘the pen is mightier than the sword’; where the pen stands for ‘writing’ because it is a part of the larger whole). Synecdoche (‘two hundred head of cattle’; ‘a parish of a thousand souls’) is a kind of metonomy. So, to put another way: if you say ‘pen’ to mean ‘writing’ as a whole, it’s clear enough what the logic of the connection is … ‘pen’ has an obvious relationship to ‘writing’. But if you say ‘Achilles is a lion’ you’re linking two very different things — because in almost every respect Achilles is not in the least like a lion (he doesn’t have four legs; he’s not covered in fur; he doesn’t have a tail, etc). The one point of comparison, ‘bravery’, is set against all the dissimilarities. That’s how metaphor works, by a sort of creative dislocation. Here’s another example: Craig Raine, in poetic, metaphoric mode, talks about ‘the onion, memory’. But in what ways is memory like an onion? Mostly we’re struck by the ways memory is not like an onion. Nevertheless, the crucial point of similarity (memory is like an onion because … it makes you cry) is given added heft and point by the dislocating function of the metaphor as a whole. Hmm. Hope that’s at least partly clear. Combination (horizontal) – constructing syntactic links; contexture. Selection (vertical) – choosing among equivalent options. Relation on basis of similarity, substitution, equivalence or contrast; synonym / antonym. METAPHOR – implying space, a-temporal connection, simultaneity. In poetry – the projection of the principle of equivalence from the axis of selection (metaphor) is used as the major means of constructing a sequence (combination; metonym). This projection, according to Jacobson, is the defining characteristic of poetry, and it expresses itself in rhyme, meter, symmetries, repetitions, motifs. The dominant mode in the poetic is therefore that of metaphor. Whereas in Prose – the metonym prevails, the chain of events, the plot, successive actions, a sequence of occurrences**. *The terms METONYMY and METAPHOR are not used as figures of speech but rather as pervasive forces organizing language. **The opposition is not an absolute one, but rather a mark of a tendency. I’m interested in the way the novel balances these two approaches, the prosy-connective and the poetic-transcendent, to talk about society, about secrecy, about connection and about disconnection. We talked a little about Bentham’s Panopticon, about Foucault’s celebrated utilization of the panopticon in Discipline and Punish; and finally a little about D. A. Miller’s The Novel and the Police (here’s a link to the Google Books version) for its reading of the nineteenth-century novel itself in the context of surveillance and policing. (The image at the head of this post is of Bentham’s original design for the panopticon; or a schematic representation of The Novel, if you’re Miller). And here’s Fagin’s last night alive. Don’t all those round cobblestones in the cell wall look a little bit like … ? Or, wait, perhaps I’m taking it too far. Welcome to the RHUL Victorian MA blog. We use this site to post materials and weblinks related to seminar texts and to post notices of interest to RHUL Victorianists, including notices of relevant exhibitions and talks in and around London. There’s also a facility to post your comments so it’s a great place to follow up on seminar discussions and continue your conversations outside of class. We look forward to meeting you at the MA Induction, Thurs 24th. The RHUL Victorian MA team. Please see below for notice of an interesting study day at the National Gallery on depictions of the city in 19thC art. Concepts of modernity and Modernism inform this study day as we explore the seamy underbelly of these two cities. We will focus on Ideas of town and country, leisure and pleasure, and the inventions and innovations which impacted so dramatically on life and art throughout the eighteenth and nineteenth centuries. National Gallery works by Hogarth, Courbet, Monet and Manet will be placed in their social and artistic context drawing on notions of gendered spaces, radical techniques and ‘the gaze’. Lee Riley, Education Department, The National Gallery, Trafalgar Square, London WC2N 5DN. For institution group bookings, contact Lee Riley to arrange invoicing. See below for a funded PhD opportunity at The University Birmingham, on British Pantomime in the Victorian period. Deadline for applications is 27th March. I’m happy to announce that as part of an AHRC-funded large grant project “A Cultural History of British Pantomime, 1837-1901” the Department of Drama and Theatre Arts at the University of Birmingham has a fully-funded doctoral studentship to start in October, 2009, to run for three years. The doctoral project will be a study of pantomime in England in the nineteenth century, with particular focus on the industrial centres of Birmingham, Leeds, and Manchester, in relation to the performance culture of the metropolitan centre of London. The chosen candidate will be based in Birmingham, supervised by Professor Kate Newey, and will benefit from working with other experienced scholars in the project team, including Co-Investigator, Professor Jeffrey Richards (Lancaster University), and contact with national and international experts through the larger research project. There will be opportunities to present work in progress at annual conferences hosted by the project, and for professional development as a member of the project team. Applicants should normally have, or be studying for, a Master’s degree in Drama, English Literature, Victorian Studies, cultural history, or a related discipline. The deadline for applications is 27 March, 2009. Those short-listed will be asked to prepare a detailed research proposal and interviews will be held in early April.